The primary mission of the country's icebreakers has always been to ensure year-round navigability of the Northern Sea Route, which is used to deliver various oil and gas production equipment to Siberia and extract raw materials from the region. The global race for the Arctic resources is now truly on. A Greenpeace mission has failed to storm Russia’s Prirazlomnaya oilrig, Moscow is actively developing the Northern Sea Route infrastructure, and the United States will invest $8 billion in Arctic projects. Russia appears to be particularly well equipped for the mission with its fleet of unique icebreakers. The primary mission of Russia’s icebreakers has always been to ensure year-round navigability of the Northern Sea Route, which is used to deliver various oil and gas production equipment to Siberia and extract raw materials from the region. The first such icebreaker, the nuclear-powered vessel Lenin, was built at Leningrad’s Admiralteyskie Verfi Shipyard in 1959. An embodiment of the technical progress of her time, the Lenin comprised 70,000 parts, with the total length of welds stretching to more than 6,000 kilometer. The second nuclear-powered icebreaker in the world, the Arktika, was built at Baltic Shipyard and remained in service from 1975 to 2008. She became the first surface vessel to reach the North Pole. 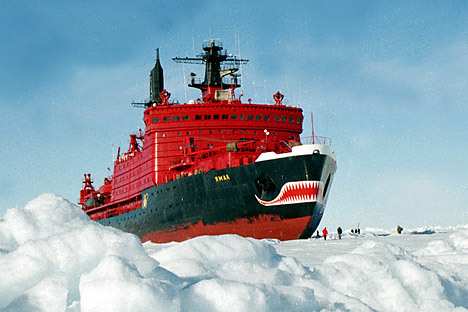 The icebreaker was briefly renamed after General Secretary Leonid Brezhnev in 1982, but got her original name back in 1986. The subsequent Arktika-class vessels had a special polymer coating applied to their hulls to reduce friction. They could break ice by moving forward as well as backward, making it virtually impossible for them to get caught in an ice trap. Since these vessels were originally designed to operate in the cold Arctic waters, they cannot traverse to the Antarctic: in the course of such a voyage, the temperature in some of their compartments would rise to 50 degrees Celsius even at low reactor power settings. The Arktika-class icebreakers can operate independently for up to eight months. During the 1999-2000 season, the very first such vessel set a record of independent operation by spending the entire year at sea without a single malfunction. In August 2005, the Arktika set another record by clocking its millionth nautical mile since entry into service, thus covering nearly five times the distance between the Earth and the Moon. The Arktika-class icebreakers are currently used both in support of merchant operations and to deliver relief crews to drifting Arctic science stations. Since 1990, they have also been carrying tourists on cruises towards the North Pole. Each of the vessels features a comfortable section of tourist compartments, swimming pool, 100-seat cinema, gym, library, and even a sauna. The subsequent Arktika-class vessels — the Sibir (commissioned in 1977, decommissioned in 1992), Rossiya (1985-2013), and Sovetsky Soyuz (1989-2010) – expedited the exploration of the Arctic region. A new milestone in the history of Arctic maritime transportation was reached with the 1988 commissioning of the icebreaking carrier Sevmorput. In a single trip she could carry enough food, clothing, and equipment to last Russia's Far Northern residents the whole year. Early this year, it was announced that the Sevmorput, which had long been moored, would shortly resume operation. She is primarily required by the Russian Defense Ministry to support the deployment and presence of military units in the Arctic, help restore the airfield and sea port infrastructure on the New Siberian Islands, Franz Joseph Land, and other Arctic territories. Another unique Russian nuclear-powered icebreaker type is represented by the shallow-draft Taimyr (1988) and Vaygach (1990) projects, built at Helsinki New Shipyard with Soviet high-strength steel and outfitted with Soviet-designed equipment, including the reactors. These vessels are intended for use in the shallow estuary waters of such Arctic rivers as the Ob and the Yenisey. After the USSR's collapse, despite all the financial hardships encountered by the country, Russia's nuclear-powered icebreaker fleet continued to evolve. The Yamal (1992) and the 50 Let Pobedy (2007, the world's most powerful icebreaker), both built under the Arktika project, remain in operation. Both these vessels are stationed in Murmansk, which is home to the Russian icebreaker fleet's managing company Atomflot. Russian engineers continue to work on new designs, and have recently laid the keel for the first vessel of the new LK-60Ya project icebreaker at the Baltic Shipyard. This variable-draft icebreaker will be capable of replacing two current types at once – the Arktika and the Taimyr. The LK-60Ya construction project costs around $1.113 billion, and two more such vessels are going to be built. Russia is also developing the LK-110Ya nuclear icebreaker, which will be capable of ensuring year-round navigability of the Northern Sea Route and of supporting Arctic expeditions. The design is expected to be finalized by 2016.